Buyer Persona Insights: What Can CEO's Do To Raise Their Buyer Insight IQ? What Can CEO's Do To Raise Their Buyer Insight IQ? For anyone who has been in business planning for a while, it is not hard to figure out that executive management has a robust obsession for numbers and quantitative analysis. Problem solving and decision making in the business world is usually accompanied by a heavy prerequisite dose of being backed up by the quantifiable and the predictive. We look at the quantifiable as if the numbers presented themselves will guarantee the results. When confronted with confounding issues about buyer decisions and their future choices, the impulse is to “run the numbers” for answers. We’ve become fairly adept at implementing various forms of enterprise CRM software that allows us to “slice and dice” the numbers for just about any perspective we are seeking. Does it help? Of course. Does it tell the whole story? Of course not. To develop a loyalty building Buyer Experience Strategy in today’s digitized world means executives need to raise their qualitative Buyer Insight Intelligence Quotient. As many executives have found out in the rapidly changing business climate, relying solely on the quantifiable can have severe shortcomings and predictability can be – well less predictable. Take the Great Recession as pundits now call the economic crisis we faced in 2008 and onward as an example. 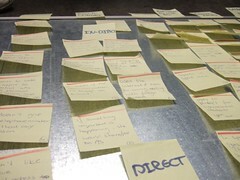 This disruptive event meant that the numbers companies collected could hardly be used for predictable strategy planning. All it takes is a cataclysmic event to literally implode the numbers and make them useless – until new numbers are collected over a new period. Addressing problems as well as formulating future growth strategies around buyer experience requires a new school of thought around the qualitative aspects of buyer insights. While quantitative buyer insight has its important role to serve, it cannot be utilized solely at the expense of qualitative buyer insight. Executives, to make effective informed decisions when it comes to developing an overall customer strategy as well as leading the organization in Buyer Experience Design, need to articulate a full story about buyers and the goals buyers are attempting to accomplish. Ignoring the qualitative can have severe consequences. Qualitative buyer insight can also help prevent consequences and get on top of what may be showing up in the numbers but no story exists to put meaning behind them. Take FedEx as an example. They knew, via quantitative analysis, that UPS was winning a battle at a crucial moment in the day when shipments were batched and sent out by distribution firms. Gaining qualitative buyer insight through investigation, they discovered that it really came down to the ease of sorting the freight, ground, and air shipments. They quickly addressed this issue and got back on the shipper’s radar screen at that crucial moment in the day. What can executives do today to raise their Buyer Insight IQ? Learn the art of storytelling and make it a part of the organization’s culture. While business acumen has always been thought of in terms of the quantitative and the financials, leaders of tomorrow will need to have strong attributes and qualitative insight acumen in making buyer experience stories relevant to the organization. Commit and invest in qualitative buyer insight. Realize that at the start, this in-house capacity may not exist. Think long-term by bringing in outside help while concurrently building in-house competency. Buyer behaviors, processes, perceptions, and attitudes change rapidly in the digital age of the modern business world. Relying solely on the quantifiable puts organizations behind the Buyer Insight IQ curve for numbers can certainly lag and also become meaningless in a short time frame. To increase the sharpness of an organization's Buyer Insight IQ, CEO’s and their teams will need to build up the qualitative side of the equation. Not doing so means a zero on the qualitative side of the equation and mostly likely a zero or negative growth number.